Encounters with pure Mataro wines are rare. Mataro thrives in the hot and dry conditions of summer, a very late comer in budbreak and ripening, Barossa is one of the few parts of Australia with a clime which allows a full and complete ripening of Mataro grapes. Barossa Valley can also be proud as the original Australian home of ancient Mataro vineyards, some of the oldest in the world, established by Lutheran pioneers during early settlement. Turkey Flat's vines were amongst the first ever planted in Barossa Valley. 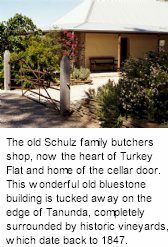 It is here at Turkey Flat, on the banks of Tanunda Creek in the Hundred of Moorooroo where wild bush turkeys once roamed, that Johann Friedrich August Fiedler planted his first vines in 1843. Grapes are macerated on skins over the course of a fortnight or more, inoculated to auspicious Mataro friendly yeasts and vinified at warmer temperatures. Treated to a spontaneous malolactic fermentation in barrel, followed by an extended term of maturation in a combination of new and prior use French oak hogsheads and puncheons.